Thanks to Jim and everyone at Urban Think! Bookstore for hosting a marvelous evening of chat, questions, and discussion of the writing world. I know I speak for everyone when I applaud the work you do for local authors. Anyone who lives in or passes through Orlando needs to check out this delightful store. From left to right: Darlyn Finch, Nancy Robards Thompson, Terry Odell, Catherine Kean, Louise M. Gouge, Dara Edmondson. 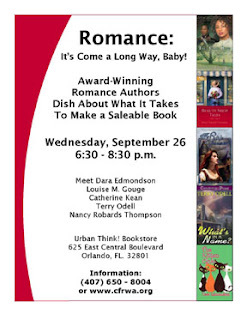 First -- anyone in Central Florida -- tomorrow's the panel discussion & book signing at Urban Think! Bookstore. Check my Sept. 11th post for more info. I've been thinking about book reviews lately. This isn't about dealing with good or bad reviews, but more with the ways different review sites approach reviewing. I'm inviting everyone to share a comment and add to the discussion. I'm curious, and full of questions. What do you look for when you read an on-line review? Do you rely on certain sites over others? Why? If a review is filled with typos and grammatical errors, does that bother you? Most of these on-line sites rely on readers, not writers, and isn't it about pleasing the reader, whether or not they can express themselves? Or should their reviews be edited for "quality" before being posted? I've noticed that some reviewers spend 90% of the review summarizing the story with a line or two of their own feelings at the end. Others paint a more specific picture with things that they liked or where things fell apart for them. Some sites won't print anything other than favorable reviews. But what is favorable? Many sites have a ranking system, usually in the 1-5 range. Often, however, I've read numerous reviews and could find nothing in them that indicated why the reviewer chose to give one book a "3" or "4" and another a "5". To read the review without the rank, I'd be hard-pressed to tell which the reviewer liked better, and why. These, of course are great for authors, because they can snag a positive statement for their promotion and nobody need know the overall score was less than stellar. And what about sites that don't rank reviews at all? Is that a better system? I'm on a friend's "quote du jour" list and this offering made me think. What's your take? This was the question posed to scientists, futurists and other creative thinkers by John Brockman, a literary agent and publisher of Edge, a Web site devoted to science. The question is different each year, this one was from 2005. I've spent two decades of my professional life studying human mating. In that time, I've documented phenomena ranging from what men and women desire in a mate to the most diabolical forms of sexual treachery. I've discovered the astonishingly creative ways in which men and women deceive and manipulate each other. I've studied mate poachers, obsessed stalkers, sexual predators and spouse murderers. But throughout this exploration of the dark dimensions of human mating, I've remained unwavering in my belief in true love. While love is common, true love is rare, and I believe that few people are fortunate enough to experience it. The roads of regular love are well traveled and their markers are well understood by many - the mesmerizing attraction, the ideational obsession, the sexual afterglow, profound self-sacrifice and the desire to combine DNA. But true love takes its own course through uncharted territory. It knows no fences, has no barriers or boundaries. It's difficult to define, eludes modern measurement and seems scientifically woolly. But I know true love exists. I just can't prove it. 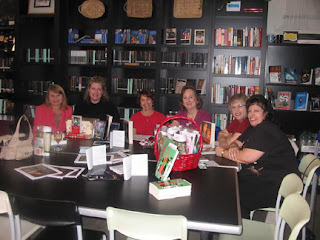 Last week, Coffee Time Romances had a special day where their forum was open to character chats. Since for me, writing is all about the characters, I posted some of the interviews and discussions my characters have had. I've posted some of them here, and they're also on my website in the 'free reads' section. I found out this morning that this was actually a 'contest' and my interview with Sarah from Finding Sarah was the winning post. Surprise, surprise. And thanks to Suzanne Brockmann for the inspiration. It's been almost a week since my last post. I wish I had a week's worth of news. Sometimes life just plods along. I spent a good portion of the week plotting and writing. I wrote over 9,000 words, which is a good pace for me, but then I had one of those days when you work all day and end up with the same word count you started with. I'd written one of those brilliant scenes, where the characters talk and the words flow from the fingertips. The only problem is, the next morning, although the writing is still looking good – there's really no need for the scene. I have to ask myself, "Does it move the plot forward?" "Are there enough plot points to justify the scene?" I'm reminded of Roxanne St. Claire's workshop where she discussed recognizing scenes that need resuscitation versus those that have flat-lined. I hate to throw things away. My closets are full of "you never know when that will come in handy" items. Or, "I paid good money for that, so I can't possibly throw it away." It's not that much different for my words. I keep a "cuts" folder in my computer where all these words can stay, and maybe someday they'll be brought out, dusted off, and find a new home. When I start moving things around, the challenge becomes making sure the continuity doesn't fall apart. Like with my car problem. On a re-read, I discovered I had both my characters at Sarah's shop, each with their own vehicle. However, when they left, they were both in Randy's truck. Sarah would never have left her car at the shop, so I had to decide how to cover the information they'd shared and the mood I'd set, yet give them their own cars. Another writing mentor, Sandra McDonald recommended rewriting -- no copy and paste. Start from scratch, with only a hard copy for reference. I've tried, but I admit failure. If I've already typed the words, I don't want to type them again. Seems kind of a waste of this computer technology. Or perhaps the scene was written in the wrong POV, and I've rewritten it. In that case, I have to make sure I haven't left any of those POV 'tells' in the wrong character's head. Which reminds me that I'm giving a workshop on POV next month. I need to work on that! What I'm writing: Chapter 15 Almost at the 50,000 word mark. I had the happiest moment yesterday when one of the techs at my eye doctor's office called to tell me how much she enjoyed Finding Sarah. Normally, I get a positive reaction from people I know who have bought my books, but that's face to face, and you never really know what they're really thinking. But for someone to take time at work to make a phone call -- well, that's not something they're under any obligation or pressure to do, so it means so much. I've got a few days in solitary while my husband travels, and I'm (once again) working on all that organizational stuff, from the little things like remembering it's garbage day and since I'm alone this week, I have to schlep the trash and recycling to the curb and bring up the empties to the more significant, like paying the quarterly installment on our income taxes, and everything in between. Milestones: I turned in the manuscript for When Danger Calls to the publisher at Five Star. Now it's a matter of waiting until I hear from an editor. I'm still waiting on edits for Hurricane Breeze from The Wild Rose Press. On October 30th, I'll be doing a session on Point of View at the Barnes & Noble in Altamonte Mall as part of a kickoff series on writing that culminates in a mega holiday booksigning on November 3rd. My workshop proposal on e-publishing was accepted by the Southern Lights Conference so I'll be in Jacksonville in March. I still get tingles when I see my book cover on the same page as Suzanne Brockmann's, even if hers is first and mine is last. Check the "Find Me" link on my website for more information. I'm Featured at the Hussie's Book Slam today. See how I got started writing by mistake. Labels: Cerridwen Press, Ciana Stone, Hussie's Book Slam, Terry Odell, What's In a Name? I had the extreme pleasure of buying three Orlando homicide detectives a few brews and some nachos yesterday--small price to pay for picking their brains in the name of realism in my book. I also walked away with a piece of Chattahoochee from a murder scene as a tangible souvenir from one of the detective's cases. Check it out here, here, or here. Plus emails and phone numbers and a promise to help out with any other questions. The challenge, of course, is to right it "right" when everyone thinks cops work the way they do on TV. But they certainly gave me enough to keep my cop busy, and filled in some important details about how they do the job. Thanks, Mick, Mark & Darrell. What I'm writing: P&P Manual for my RWA chapter's contest. Randy and Sarah are waiting. Yesterday afternoon, my husband and I drove to Brandon, near Tampa, Florida. As soon as I'd discovered Suzanne Brockmann was signing and doing a Q&A that evening, I recruited my husband to come along because I don't drive well at night. He agreed, and even ended up having to turn down a behind the scenes tour at NASA that included (although he didn't know it at the time, or I think he'd have backed out) donning clean suits and getting inside the shuttle cockpit. But he's a man of his word (and MAYBE he also would worry about me driving 75 miles late at night) and came along. We grabbed some dinner and then headed to the bookstore where Suzanne was setting up for the signing. She's ever so friendly and gracious, and signed the copy of her book I'd brought along. What really impressed and amazed me was that she remembered my name. I'd spoken with her a couple of times at RWA Nationals, but there were thousands of others there. And, at the conference, I always had a name tag on. We had exchanged a few emails, but I never expected her to match the face with the name. Heck, I used to work at conventions and would run into faces that looked familiar, but without their name tags and out of uniform, I'm hard-pressed to remember the names. That Suz greeted me personally more than made up for the fact that I didn't win anything in her raffle. Priceless. Her Q&A was enlightening. Her writing method is the opposite of mine. She can plot multiple books in advance. I can't plot more than a few scenes in advance. Should it ever happen that I have a fan base, I hope I'll be half as charming. Make that one-fourth. Thanks for a fun evening, Suz, and my husband enjoyed himself, too. For the record, he schlepped his briefcase full of work and intended to sit off in a corner while I did my thing, but he not only sat in on the Q&A but asked a few questions of his own. September crept in on a holiday weekend, so I already feel behind. Taking time off is great, if only the work didn't pile up. Because it's a new month, I've updated my website, added another Free Read and a new contest. How would you like to be in a book? I'm giving away the chance to name a character in one of my manuscripts. Check my site for details. I've added a guestbook (I think). If you want to help out, see if it works. It's moderated, so you won't see your comments right away. Link's at the bottom of the "Welcome" column. I'm afraid I might reached my technological limits, even with a Help Desk Support Person. If you have problems, there's an email link to me on my site. Nearly 1000 vehicles were stopped. I'm not normally a night owl, but it was worth staying up all night to observe the Labor Day DUI checkpoint. Admittedly, it's not the optimal way to catch drunk drivers (except the REALLY stupid ones), but it provides awareness. MADD (Mothers Against Drunk Driving) was out reminding people that driving drunk is not a victimless crime by displaying a huge banner with pictures of victims. If it makes people think twice about drinking and driving, it's of value to the community. As members of the Civilian Police Academy Alumnae, we were allowed to be present and observe our law enforcement officers in action. Whether or not our promise to provide desserts had anything to do with the decision is up for debate. "Real" food – pizza, chicken wings, etc., was donated by local restaurants. We were issued orange reflective vests and told we could go out on the line and observe as long as we stayed out of everyone's way and were alert in case people got angry and jumped cones or pulled weapons. The setup was in front of the county fairgrounds and included the mobile field testing van, a couple of 'paddy wagons', tables for interviews and booking, all brightly lit by portable lighting (with noisy generators). The active "line" extended for several blocks and checked every westbound car. The DOT was also checking truckers. Turns out about 90% of the drugs entering the state come in on the big rigs. First observation: Cops DO eat doughnuts. And with very little guilt. They also eat brownies, cookies, and just about everything else on the tables. Only one asked if there was fresh fruit, but was happy enough to eat sweets when there wasn't any. I'd considered bringing it, but fruit salad isn't finger food, and all the necessary accoutrements would have complicated matters, so I opted for cookies. Note: if you transfer the contents from the store box to a foil pan, people assume you baked them. I'm a decent cook, but I don't turn on my oven in August. It was a hot August night, and we provided cold water down the line as well. I was impressed with the professionalism of the LEOs, and there were a lot of them from many neighboring community forces. All were happy to talk to us, and would explain what they were doing. I also enjoyed listening to the way they talked to each other when they weren't checking cars and drivers. Jargon makes the writing more authentic. I will admit I've never been called 'ma'am' so many times in my life. But every cop was enthusiastic in thanking us for food and water. Seems a small price to pay for what they're doing for us every day. I got to meet Cocoa, the drug dog, watch field sobriety tests, see a lot of people in handcuffs and hear a lot of stories. I also breathed more exhaust fumes than I care to think about. Every driver was asked for license and registration. The cops worked in pairs, one checking the vehicle, the other talking to the driver. While the majority of tickets and arrests weren't for DUI, they snagged a lot of people driving with suspended licenses, equipment violations (mostly overly tinted windows). And the ones too stupid to get rid of their drugs paraphernalia or open containers before reaching the officers (or turning off onto the side streets and avoiding the line entirely—by law, they had to put up signs that there was a checkpoint ahead). I did feel sorry for the guy in the taxi whose driver didn't avoid the route because I know he ended up paying a premium in 'wait time' on the meter.